This kit includes all you need to start brewing your own tangy-sweet, nutrient-dense kombucha. It's easy! Let us introduce you to our little friends—our little microscopic friends. They have a cute nickname—SCOBY—and a wonderful skill: transforming sweetened tea into deliciously fresh, probiotic kombucha. If you've been intrigued but a little intimidated by the idea of brewing your own 'booch, this all-inclusive set will help you do it. 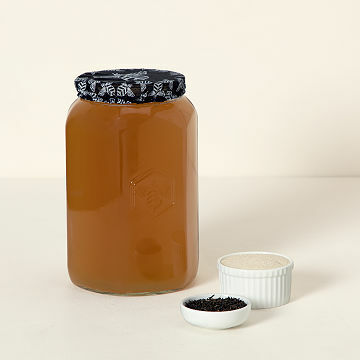 Inside the sweet box you'll find SCOBY's food (black tea and cane sugar, both organic), their shelter (a 1-gallon glass jar), and a claim code (no charge) for the SCOBY itself. Follow the included instructions, and in about two weeks, you'll have 'booch bragging rights—and an endless supply of brew, because one SCOBY can produce infinite batches. It's nice to have such loyal friends. Assembled in Orlando, Florida. Makes yummy kombucha, so nice to get started with this product! Easy to get started and we've already ennjoyed several rounds of brewing! I bought the deluxe kombucha starter kit for my wife as it had all of the glassware and materials for her to instantly get into a new hobby. The kit arrived in Northern California in perfect shape and the redeemed SCOBY arrived promptly in an iced pouch. So far, my wife has played with ginger and citrus infused batches, and the instructions are super easy to follow.